LORDS OF CHAOS is a dark, depraved, brutal and downright disgusting film that depicts the birth of Norwegian Black Metal – and it’s wholly riveting from start to finish. The story is told from the perspective of the band MAYHEM’s evil ideology, a fringe movement that is laughable in some circles, but can be quite dangerous in others. Is it just to sell records, or have these guys started to lose their minds? Jonas Akerlund’s film works as the biopic from hell by depicting the reckless abandon of youth in horrifying and gratifying ways. Part cautionary tale, this acts as a version of A STAR IS BORN for the age of toxic masculinity. While there are liberties taken for the sake of a cinema, this film feels grounded is its depiction and it’s not for the faint of heart. Beginning in 1987, the film centers on Øystein Aarseth (Rory Culkin), better known by his stage name Euronymous. He’s a middle-class 17-year-old living in Oslo, Norway – a prosperous country filled with hope, empathy and love for their fellow countryman. However, Euronymous detests all of these things and supports suffering and evil on every level. He makes wild statements concerning burning Christian churches and murdering people. This all seems to be serving a brand to promote his band Mayhem, the world’s first Norwegian Black Metal band. He essentially becomes the figurehead of this movement when we recruits a young Swedish guy, simply called Dead (Jack Kilmer). There has never been a character quite like this shown on screen; the guy mails a crucified mouse, he puts a dead crow in a bag and breathes it in (so he can literally breathe in death) and he buries his clothes and sleeps in a coffin. Kilmer personifies this guy well, who is empty of all personality and only perks up when it’s time to go hunt for cats. The duo achieve a sense of notoriety based on their radical stage presence that is meant to “weed out the posers.” Dead slices his arm with a broken bottle while performing, they throw pig heads in the crowd – you name it, they’ll do it. This is a film with some truly disturbing stuff, and Aklerlund (POLAR) is up for the shock factor. But he isn’t just serving that aspect entirely. He tells a cohesive story complete with character arcs and scenes where you can feel the danger lurking. Somehow we care about these guys and want it all to be OK… and it won’t be. The cast of LORDS OF CHAOS. Courtesy of Gunpowder & Sky. Part of all this rebel-without-a-cause attitude appears to just be for show, but slowly the movement known as The Black Circle starts to be rooted in competition with the arrival of Varg Vikernes (Emory Cohen). He starts actualizing this chaos all in the name The Black Circle, and the music consequently falls by the wayside. Akerlund isn’t interested in making LORDS OF CHAOS a depiction of Norwegian culture, or looking for authenticity in that realm, he focuses his efforts on getting the spectacle behind this stranger-than-fiction, rise-and-fall story. He and screenwriter Dennis Magnusson focus on the absurdity in taking yourself too seriously. The image behind Norwegian Black Metal is a fun marketing tactic and attractive in theory, but taken to practice it’s dangerous and frankly comes off as laughably foolish behaviors. In another universe Taika Waititi directed LORDS OF CHAOS and it’s filled with jokes goofing on the self serious nature of the lifestyle. Norwegian Black Metal was never supposed to be for the masses and the act of selling out is giving into the “pathetic empathy” of the modern world. Varg brings in an energy that catches on like a virus, and the performances of Culkin and Cohen start to take over. Both start out looking for the same goals, but get caught up in the outward perception of the brand and band they have created together. It becomes a venomous struggle for power on how to manage this emerging culture and where to draw the line. 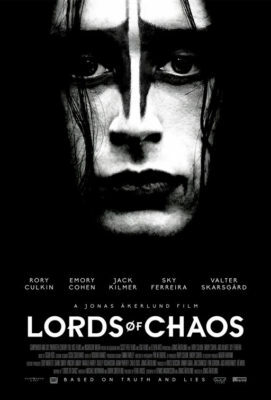 LORDS OF CHAOS is enthralling piece of filmmaking that really comes together and will make you turn away. Akerlund and the cast create a film that has the structure of a mainstream rise and fall, but with the content of a snuff film. The purpose of this film isn’t to make any harsh moral judgments, because some of the facts in the film may have been skewed from the truth. There is a musty essence to this film that allows it to be so haunting and engaging. Take a deep dive into Mayhem, I dare you. LORDS OF CHAOS opens in limited release on Friday, Feb. 8. In Dallas, opens at the Texas Theatre on Feb. 20.